How's it going, everybody!? This year has already been one of the best for video games I can recall. The people at Telltale Games are making sure to continue the trend. This past week they launched the second season to their excellent Batman series. If season one was any indication, awful things can happen to already established franchises. The first episode of the new season is no different. I'm here to help prepare you for a dark, violent ride with the Cape Crusader in the city of Gotham. This episode, like the first in the last season, starts off action-packed. This helps draw the player into the game. This time around it even gives you the option of how to take down an enemy. For example, you can either finish off your opponent with a roundhouse kick to the head or ferocious body slam. It makes the fighting spots more entertaining than pressing a couple of buttons or clicking the left stick in a certain direction. Also, like last season we get to play around with a mini game during the Detective Mode. Again, we get to use Batman's knowledge and tech to solve puzzles. The mini game puts Batman's talents as a crime-solver in perspective. Throwing in The Riddler's riddles helps improve this mode. I wish I could spend a whole episode solving the riddles and puzzles. I carried over my save file from the first season and already, I can tell my choices from last season making a difference. James Gordon is the new commissioner, and he credits Batman for the lower crime rate. Bruce Wayne is missing a chunk of his ear, and poor Alfred is suffering from PTSD. I'm happy Telltale kept the certain choices I made stick in this new season. It makes it feel as if the choices I made last season did truly mean something. It doesn’t take long for us to be introduced to this version of The Riddler. Like Riddler's in the past, this version has a huge ego to match his big brain. The only difference is the sheer ruthlessness he shows his victims. He carries around a haunting scythe in a shape of a question mark. He shows the player quickly how deadly his weapon can be, by slicing open a nameless victim's throat. Telltale's Riddler once terrorized the city of Gotham. It doesn't seem as if the game will explain why he left, but it doesn’t really matter. 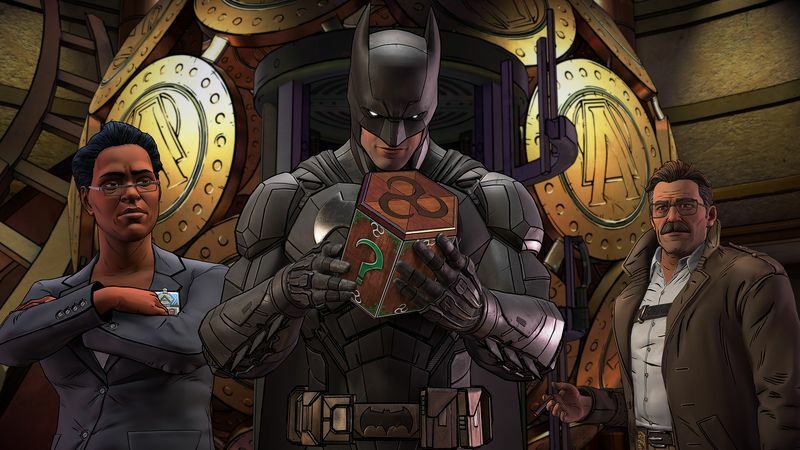 Telltale's fresh take on an older Batman villain is welcome. Riddler isn't the only steadfast Batman character of the past to be introduced. It seems like this season will be jammed-packed with all types of important characters. The biggest sign is the introduction of Amanda Waller. Waller and her team of agent spies are in town to take down the Riddler. And you better believe this version of Waller is like all the others. A ruthless, badass willing to do anything to catch her man. We also, get reintroduced to tech guru Lucius Fox. Though he isn’t the only Fox we meet. We get to spend some time with his uber-smart daughter, Tiffany. I have a feeling she is going to have an important role in the next four episodes. Unfortunately, our time with the Fox family doesn't end as cheery as one would hope. An attack on Wayne Enterprises makes it all too personal for Bruce and Tiffany, leaving the new relationship between Bruce and Tiffany on the rocks. Finally, good ole John Doe (eventually The Joker) is back in Bruce's life. The tension between Doe and Wayne is palpable. Or at least for the player, it can be. We all know whom John Doe will inevitably become later down the line, which makes it harder to make choices involving Doe. Your conversation leaves you in a peculiar situation with Doe. I want to make choices which distant me as far from him as I can, because I know he is The Joker. Yet, his information is too vital to ignore. His are the best moments in the new season so far. The choices make you question the type of Bruce Wayne/Batman you strive to become. Telltale seems to be on a roll with superhero based games. The company dove into Marvel this summer with Guardians of the Galaxy, and now the second season of Batman is off to a strong start. If the first episode of the Batman season is any indication, then we are in for a dark and twisted ride. I didn’t see the end coming at all. I can't wait to dive into the second episode! !